SNIP: On the eve of the most important global climate meeting in years, a definitive United Nations report has found that the world is well off course on its promises to cut greenhouse gas emissions — and may have even further to go than previously thought. Seven major countries, including the United States, are well behind achieving the pledges they made in Paris three years ago, the report finds, with little time left to adopt much more ambitious policy measures to curb their emissions. That verdict is likely to weigh heavily during a U.N. climate meeting that begins in Poland next week, where countries are scheduled to discuss how well they are, or are not, living up to the goals set in the landmark 2015 Paris climate agreement. The UNEP report finds that, with global emissions still increasing as of 2017, it is unlikely they will reach a peak by 2020. Yet such a peak, required before any decline can occur, is a near-mandatory outcome if the world is to have a chance of achieving the Paris agreement’s most important goal: limiting the planet’s warming to “well below” 2 degrees Celsius (3.6 degrees Fahrenheit) above preindustrial levels. 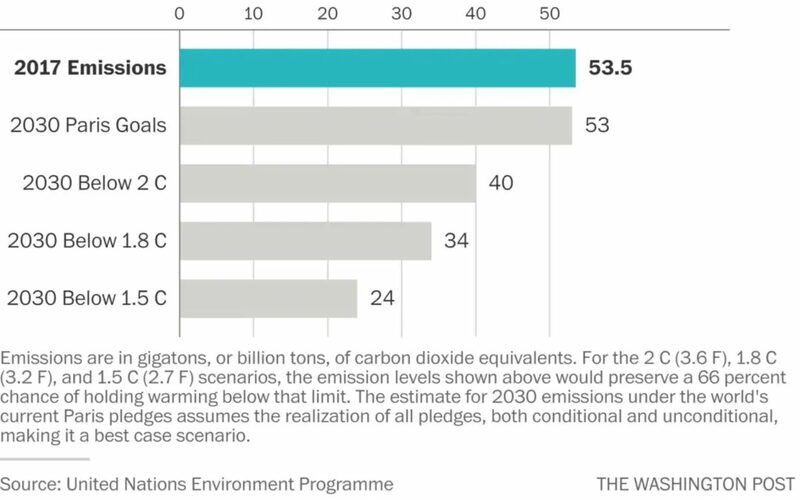 Current global emissions were 53.5 billion tons of carbon dioxide equivalents in 2017; if all countries live up to all promises made in Paris, they would also be about 53 billion tons in 2030. (Emissions are projected to grow with the growth of populations and economies, so basically, under the current Paris promises, the world is running simply to stand still.) This sets the world on a path to about 3 degrees Celsius (5.4 degrees Fahrenheit) of total warming by 2100. Current actions by major emitting countries — all of whom agreed in 2015 to be part of the Paris climate agreement, though the United States is now backtracking — are not nearly enough to prevent another half-degree or more of warming, the report finds. “We need three times more ambition to close the 2-degree gap, and five times more ambition to close the 1.5-degree gap,” Drost said.